The purpose of testing is to verify that the requirements for a new solution are actually met. This is based on acceptance criteria and test cases. The purpose of test management is to check if the requirements for a new solution are fulfilled. Acceptance criteria and test cases are the foundation of this. They should be defined together with requirements and use cases during requirements engineering. documenting errors and tracing bug fixed. Creating a requirements diagram or a use case diagram. In these diagrams, the relationships between requirements or use cases and their test cases are shown to support communication with the stakeholders. Deriving a real time query from a requirement or a use case in the scope of a real-time query which is available at any time to check that your test cases are available. The entry form for test cases opens when you click the command Create test case in the favorites bar. 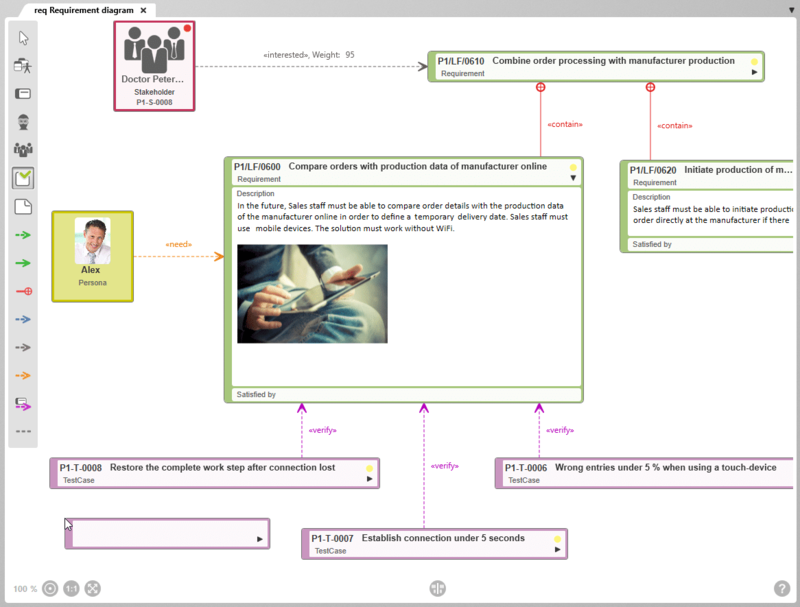 An example of creating a test case in a SysML requirements diagram. Test cases are graphically connected to the requirements that they refer to. Test cases and their relationships are more than just images – they are the graphic map of artifacts in the objectiF RM repository. 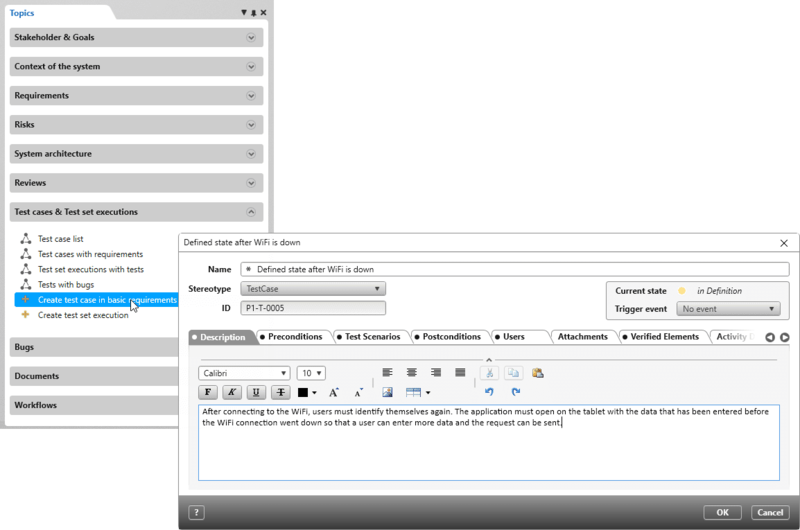 A form is used to edit test cases. What if the form in objectiF RM doesn’t suit your needs? Then just replace it with your own. Test cases always have the same structure. With objectiF RM, you can establish the methodical standard for test management that suits you best. 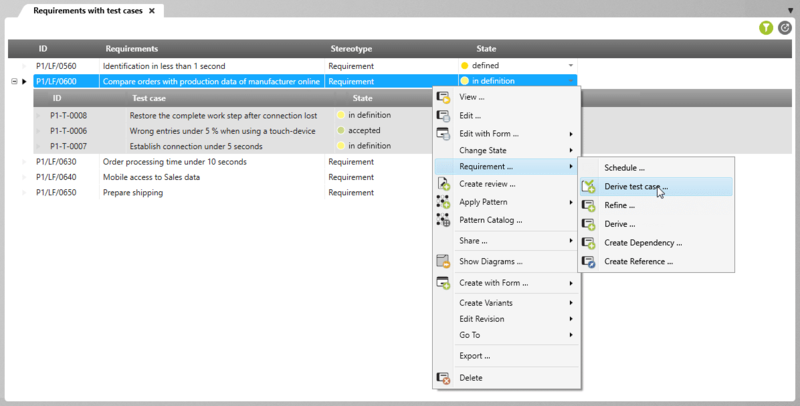 A test case’s relationships to requirements and use cases can be created with a form, or just enter it into a diagram. In this case you will automatically find the graphically displayed relationships in the form. The advantage: Quickly and consistently record or clarify with modeling – use the medium that best suits your project situation. You can also verify test cases, just like requirements, with objectiF RM’s asynchronous reviews. Stakeholders who are not using the system can be included thanks to browser-supported reviews. The unique verification mechanism ensures high quality test cases. Real-time requirement queries with allocated test cases help you check whether all requirements are covered with test cases. Can you see missing test cases? Then derive them directly in the list. You can gather tests that should be run together with objectiF RM with a wizard: enter the source of the requirements that need to be checked. This can be a backlog package, for example. The wizard determines the relevant test cases and generates a test set containing the tests to be carried out. Testing means carrying out the tests that are gathered in a test set. Test sets are saved and versioned. They also have a state-dependent relationship. A regression test can be generated by copying a test set. So it’s easy to repeat tests. How does testing proceed, which tests are still there? Which tests were successful and which were not? How much progress did the testers make with the test sets? The answers can be read from the current states of the tests and the test set executions. You always know the current test status. You can trace the progress of test sets. 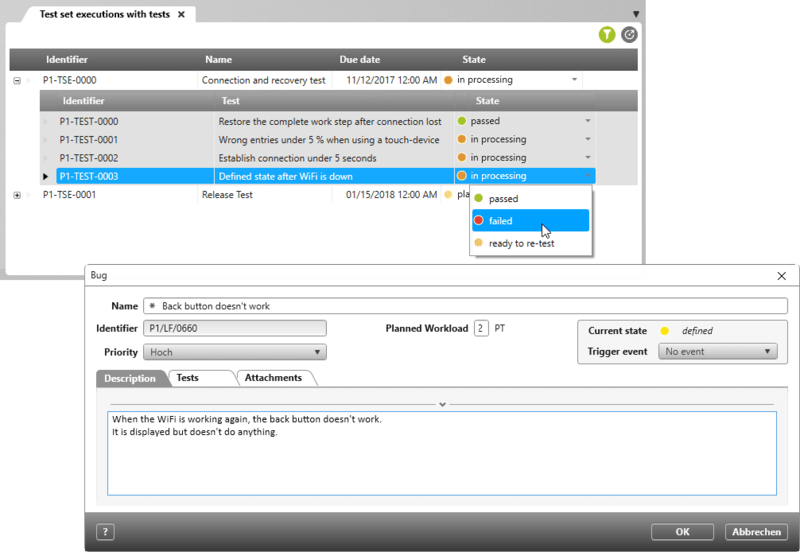 You can tailor the testing workflow for your organization by configuring the state machine for tests and test set executions. If you find mistakes when testing, document them straight away with objectiF RM. There is a default form for doing this, but if it doesn’t suit your methods, then just customize or replace it. 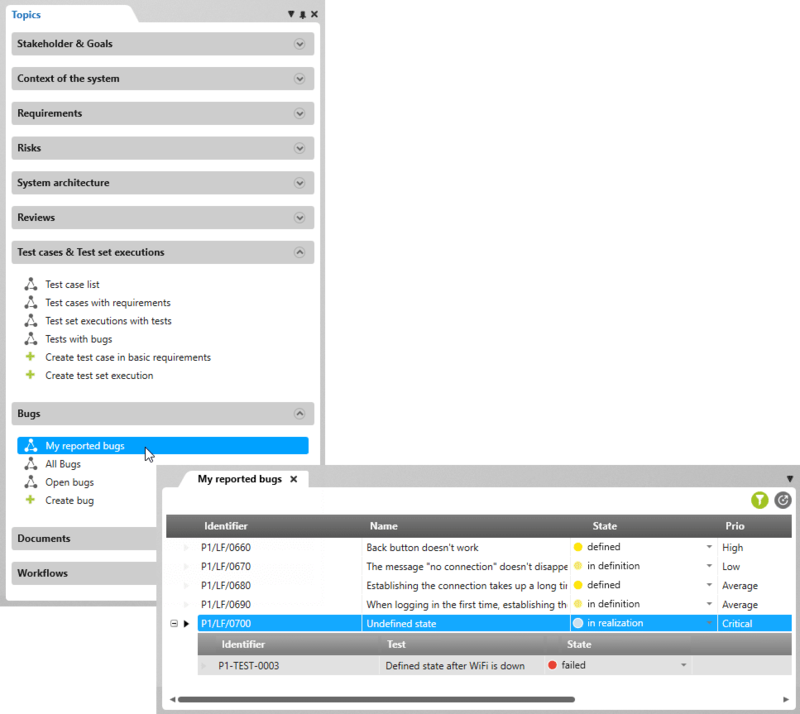 objectiF RM can be adapted to your work methods, you don’t have to adapt to its. What about the bugs that you found as a tester? Have they already been fixed? The answer can be found with the corresponding real-time repository in objectiF RM. As a user, you can configure existing queries like the one presented here or define your own ones. How to record test results: Set the right state for the test and if necessary derive bugs. Automatically generated bug history documented at every state change. How do testers find out whether the bugs they found have been fixed and tests can be rerun? Through state changes in the overview of the test execution and, if needed, through notifications. In other words: automatically. Which events are distinguished between and the effects that they trigger. A workflow suited to your organization.